Dental caries, also known as cavities, are caused by breakdown of the tooth enamel which leads to tooth decay. Although cavities are often preventable, they are the most common chronic disease among children and adolescents 6 to 19 years old. Cavities are very prevalent among adults too. According to the National Institute of Dental and Craniofacial Research, ninety two percent of adults age 20 to 64 have had dental caries in their permanent teeth. The dentists at McCarl Dental Group strive to help patients have excellent oral health and keep healthy teeth and gums throughout their lives. We do this with a combination of excellent dental care, education, and encouragement to motivate our patients to take the best possible care of their teeth and gums. Contact our team in Millersville, Maryland at McCarl Dental Group to schedule a $55 New Patient Professional Teeth Cleaning and dental exam, including whatever x-rays are necessary. In addition to routine dental cleanings and check-ups, it is important to call your dentist at the first sign of a cavity. Keep reading to learn warning signs of tooth decay. Like most oral health issues, the signs and symptoms of cavities may be subtle. In many cases, patients have no idea they have tooth decay. 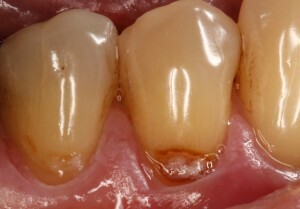 Unfortunately, left untreated, cavities breakdown the enamel of the tooth often leading to pain and possibly infection. Regular visits to our office every six months, or more often if indicated, make it possible for our team to diagnose and treat cavities in their earliest stages. Between dental appointments, you should establish daily tooth brushing and flossing routines that reduce the risk for tooth decay. We also encourage patients to understand the warning signs and symptoms of tooth decay and to seek treatment right away. Sensitivity – cavities cause teeth to be sensitive to changes in temperature and while eating sugary or acidic foods. Tooth decay may also cause hot or cold sensivity. Toothache – the decayed tooth causes pain and discomfort especially while chewing. Dental wear – small cracks, chips, and breaks are common on the surfaces of teeth as the cavity breaks down underlying dental structure. Dark or white spots – in some cases, patients notice darker spots in their tooth enamel caused by the decay. Demineralization leads to white or chalky spots on tooth enamel caused by cavities. At McCarl Dental Group, we are dedicated to helping patients prevent tooth decay, gum disease, and other oral health concerns. The foundation of any oral hygiene routine is daily tooth brushing and flossing between each tooth and behind the back molars. Our dentists and hygienists are happy to help you improve your at-home oral health routines. In addition to excellent home care, regular dental checkups and professional teeth cleanings at McCarl Dental Group are the best way to prevent cavities and keep smiles healthy. If you do experience tooth decay, we offer the most cosmetically and restoratively effective treatment option – tooth-colored fillings. Composite resin fillings blend seamlessly with natural smile color, and because they bond directly to the tooth, tooth-colored fillings allow us to preserve more natural dental structure. If the cavity is too large to restore the tooth with a filling, we offer comprehensive dental care including natural looking, durable porcelain crowns and veneers. Whether you’re experiencing symptoms of tooth decay or it’s time for your dental checkup and teeth cleaning, contact McCarl Dental Group today. We’re happy to help you maintain your healthiest smile. Comments Off on How Can I Tell if I Have a Cavity?